Free Part Time Jobs Online Registration 2018 For College Students that Work From Home without investment Free Part Time Jobs Registration Form 2018 . Allahabad High Court Recruitment 2018 UP Government has establish Special court to cover the cases of political leader such as Vidhayak, Sansad etc with Special Court Jobs Group C, D 7 posts soon filled by court and it will be contract base up to february 2019. Private school scholarship we have a List of Private Scholarship for financial Aid for Private school, the grant of private school is granted to Low income families, Meritorious Students, Toppers. In India Private School, College and University is operating more than Government School, College vice versa. Those students who study in Private school is called are you studying in convent school or you are convent students. Mostly people selected in India Top Engineering College, Medical School you will see they belongs to background of Boys High School, Girls High School etc i.e. convent. UP IBP Gas Dealership:- There are many businesses in India are open for youth to start his/her career. Government has started Startup India Scheme by inviting that young mind who have bright future and make in India to be in runner list of becoming Number 1 Economy. 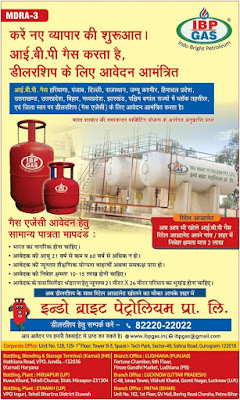 Opening Gas agency, Taking dealership of gas agency is the way to become Lakhpati in your area. Opening gas agency not only create your family live like king but also help to become social welfare under superstation of poor people to give subsidy and provides free gas connection. UP Krishi Vigyan Kendra :- Government will open 10 New Agriculture Science Center in Uttar Pradesh with high tech facility to increase the income of farmer on doubling. In these Krishi Vigyan Kendra farmers, Dairy person and Youth who are pursuing degree course of BSC, MSC and Diploma in Agriculture, Horticulture and Food Technology are in preference list. UP Agriculture Technical Assistant Result 2018 please refer to advertisement regarding 2059 Krishi Sahayak Result 2018-19 positions under Adhinasth Sewa Ayog, UP published on dated 22 July 2018 for which last date of online submission of application was 23 August 2018. For 2059 permanent vacancies of UPSSSC Agriculture Assistant written examination will be held on November December at Lucknow, Allahabad, Kanpur and all leading city of Uttar Pradesh. In this regard, it is to inform. 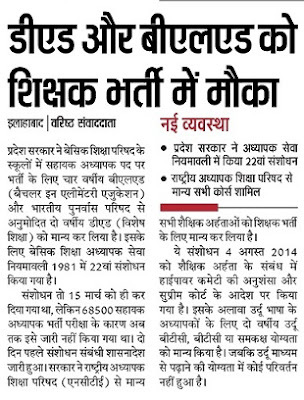 UP B.El.Ed Teacher Recruitment 2018:- Uttar Pradesh Government has accepted the suggestion from Basic Shiksha Parishad that prefers to select B.El.Ed 4 year degree holder who is called Bachelor in elementary education along with diploma in elementary education that affiliated with Bhartiya Punarvas Parishad. GFSU CCC Registration 2018 Gujarat Forensic Science University is in a hurry to accept advance CCC Online Application Form 2018 from suitable aspirant who have desired to update his/her knowledge through course on computer Concepts. CCC is registered with DOEACC now called NIELIT for preparing computer engineers through affiliate of recognize college. There is 2 CCC course conducted by NIELIT 1st is normal CCC and 2nd one is CCC+.